Considering how long this post is supposed to be, I belatedly realized that I should have taken a lot more pictures of the actual product. Well, fair warning before you proceed: you'll just have to be okay with a wall of descriptive text. Let's begin my review of the brand new L'Occitane Immortelle 28 Day Divine Renewal Program with this picture of myself sans makeup (except for shaded-in eyebrows, because that is my hamartia). Little pimply spots aside, I think my skin is as good as it can ever get. I took this photo two days after strictly adhering to the program for 28 days. The Immortelle 28 Day Divine Renewal Program is meant for use during the nighttime, so I stuck to my regular ritual in the morning (mostly Tatcha) and tried my best to only use the included oils at night. Even though the pamphlet said the oil could be used alone or under your regular moisturizer, I embarked on this experiment determined to only use the oils, to experience an unadulterated effect. The program is split into four weeks, each week containing seven vials of oil for each night's use. The oil is housed in a detachable packet (not only useful for differentiation but also for travel). To open, you snap the top of the packet to reveal a little spout, then squeeze the oil out onto your palm. This has a bit of a learning curve, because the first few times I pressed too hard and some of the precious oil squirted onto my apartment floor. That said, I do like the way this is packaged, since it ensures that we use the exact recommended amount of product each day. After all, a pea or dime-sized amount is a subjective description. The scent of the oil remains the same throughout the four weeks. If you've ever had the pleasure of sniffing the Divine Oil, this is basically a concentrated version. The pamphlet includes specific instructions on how to apply to oil, but each day's routine begins with warming up the oil between your palms and holding it up to your face and breathing in thrice. This part of the program is what I miss the most, as the Immortelle scent works wonders in soothing and calming me down after a long day. I felt the most obvious and immediate effects of the oil in Week 1. 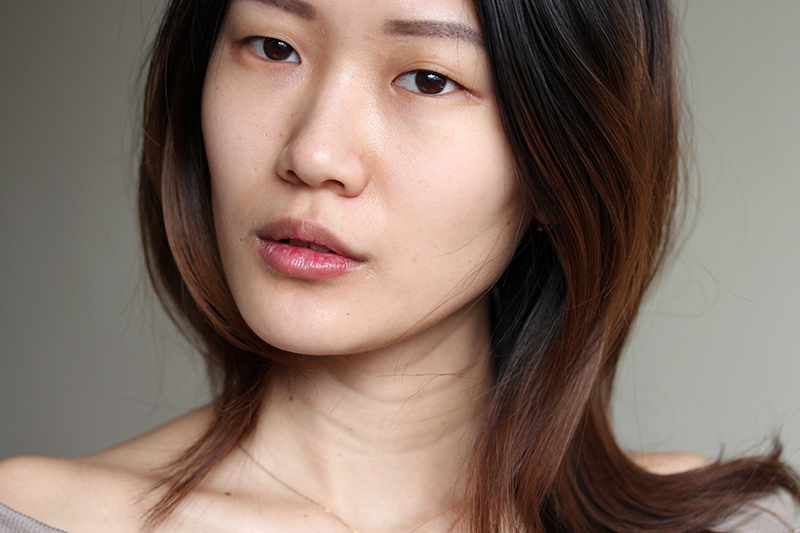 Before I started on the first vial, I had flaky, gritty skin on my chin (it literally felt like sandpaper). Within first application, I noticed that it felt smoother, and by day 3 it was completely gone. My skin was completely smooth! We enter hazy territory in the following weeks, because the effects that the program purports to deliver are less clear (how am I supposed to know if my skin feels more nutritious and balanced?). Sadly, my gritty chin resurfaced at the start of Week 2, and a giant pimple formed on Day 3. I also suffered an allergic reaction to a pimple-curing product I used. I do not think the program caused any of these symptoms, but it's worth noting that while it didn't make my skin worse, it was not necessarily the antidote to irritated skin either. Now, I know Week 2 sounded bad, but apart from those few problem spots the rest of my skin basically still looked like the photo above. Week 3 was when I realized that I should heed L'Occitane's advice and use the program as a supplement to my regular nighttime routine rather than treat it as a be-all and end-all to skincare. The oil alone simply was not enough to combat the harsh reality that is winter in the Northeast. I experienced surface dehydration throughout the end of Week 2 and Week 3, which was remedied by layering a moisturizer over the oil. I felt both relief and sadness at the end of the program. On one hand, I like trying new things on my face (a fundamental beauty blogger requirement) and had to put off testing a whole bunch of products because I committed to 28 days of using just one oil; on the other hand, I've grown to enjoy the routine of pouring the oil into my hands and smelling it before I apply it to my face. Whatever skin woes I experienced in Week 2 and 3 (more likely caused by hormones and weather rather than this program), by the end of Week 4 I had even, glowing skin. At $130, this is much more affordable than other four-week programs I know (Guerlain's The Cure Treatment is a whopping $1,550). I've never tried the latter, but I cannot imagine that its effects can be so drastic that it warrants the price point. 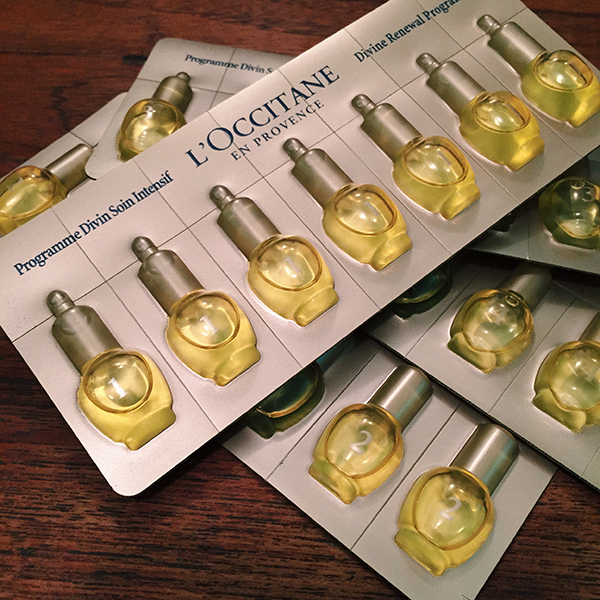 The L'Occitane program is much more palatable to the bank account, and is a nice supplement to your regular skincare routine with subtle results. I think it will most benefit those who find it hard to stick to a dedicated regimen. 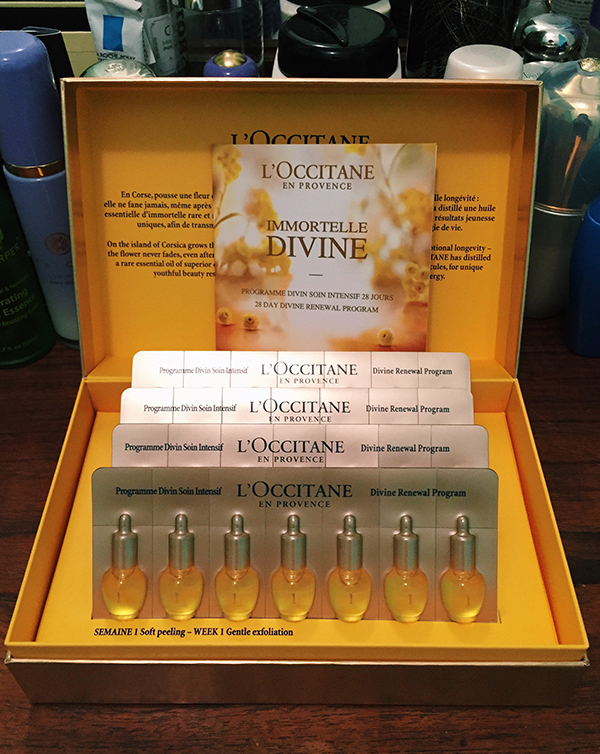 The L'Occitane Immortelle 28 Day Divine Renewal Program is available beginning February 18 (my birthday!). In celebration, I am giving it away to one lucky winner. Please enter the sweepstakes through the Rafflecopter widget below and I will pick a winner one week from now!